A lot is on the horizon in SLC dance. This weekend saw two shows: RW’s Nikolais performance at Capitol Theater and BodyLogic at Sugar Space. Reviews are coming up for both soon. But if this weekend wasn’t enough, more is on the way. Next weekend co.da, the cooperative dance company housed in Sugar Space, shares their second annual show. The company has a unique format designed to share resources and allow multiple voices to be heard. The theme of the show this year is “Romance Novel” and also features guest choreography from Camille Litalien from Utah State University. Later in the month loveDANCEmore will host its second Arrivals/Departures Gallery Stroll at the Rio Gallery. Featuring live performance by Ashley Anderson, Efren Corado, Katie Meehan, Sam Hanson & more. As always it’s free and you can see dance film projects as well. The show stays up through March 8th but this will be the last live performance. Arrivals/Departures features a film by Ellen Bromberg but she’s also up to something new, a collaborative project with Jim Agutter from the University of Utah School of Architecture + Planning. The project culminates in a performance event at the Museum of Natural History on Wednesday February 13th and February 20th. The show starts at 7pm and cycles through twice until 8:45. No need to stay the whole time, just like Gallery Stroll, audience members can come and go as they please. It’s free with a museum admission. Tonight is the last Mudson of Fall 2012. 7:30pm at the Masonic Temple (650 E. South Temple). Free admission to see works in progress by: Nancy Carter, Efren Corado with Tara McArthur, Karin Fenn, Eileen Rojas & Movement Forum. 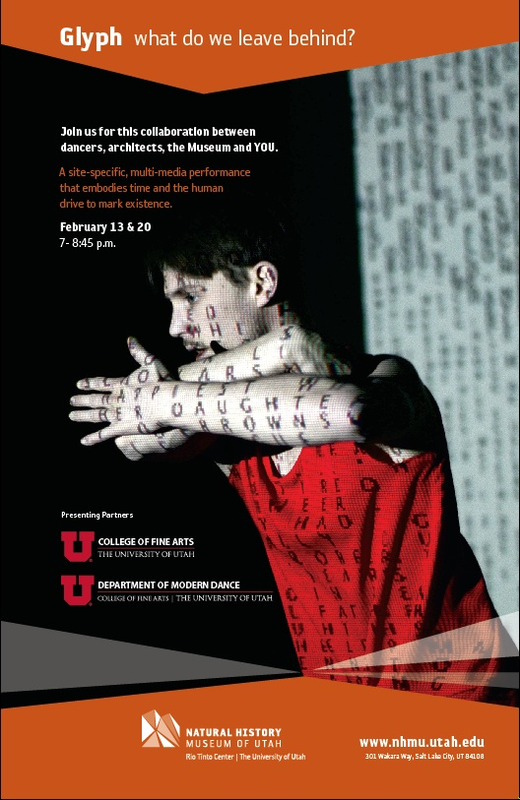 If you haven’t read it check out this article from SLUG which gives really good insight into how Mudson isn’t just another dance show, but instead is a forum that changes the kinds of dance being made in SLC and the kind of dance audiences. Also Mudson is an open application process. You can apply here. for Spring 2013. Applications due December 1st. Be forewarned, this is a google doc and that flips some people out. I promise that you can print it and fill it out. I absolutely promise. Kathy Adams writes the Fall Arts Guide for the Trib and this year it had a unique slant. Because we all usually know what companies have full seasons, or the websites to look at for pick-up projects (Sugar Space, the Rose, loveDANCEmore), she looked at unique efforts by companies to expand their work beyond the theater. We all know dance doesn’t just have patrons fall into seats and that it requires strategic planning and programming. These challenges grow every year and we think it’s great that Ballet West is collaborating with breweries, RSL fans might head out to see RDT. Odyssey’s collaboration seems the most apt, as will take their commercial work to the specific venue of a haunted house where I think it will be met on new terms and interest people that might not head to the theater. Although “Mudson” has become a dance space in it’s own right, we are happy to be included on the basis that experiments are regularly offered and can emerge by vacating the traditional theaters of SLC. While she rightly chose to highlight Sam and Kitty for their bold decision making, the experimentation continues for even those artists participating in traditional idioms, apply for the spring and see for yourself. Applications should be up before the weekend is out! It’s that time of year again when City Weekly gets some voting underway for it’s annual Artys issue. In years past loveDANCEmore has been rewarded for the performance journal, being a dance start-up and Ashley Anderson’s performance with Regina Rocke at Sugar Space. The Artys regularly mention independent projects but they don’t always make it to the ballot and you should write some in!! If you do a write-in make sure you click “other” before typing and check the tally at the bottom so your voice is represented. On the link above some independent projects you might consider mentioning as write-ins include…..
Daughters of Mudson and it’s various choreographers and stand-out performers. The films made for Dances Made to Order by Sam, Aniko and Josie. Choreography and performance by local groups like My Turkey Sandwich, co.da, MOFO and the choreographers of Suite. Performers and choreographers participating in the Nox Contemporary shows in July. Tours like tEEth by Dance Theater Coalition. and of course, learning to loveDANCEmore as a great multimedia publication!! MUDSON is happening in JUST ONE MONTH. September, October and November play host to twelve works-in-progress on stage and an additional dance film. The third Monday of every month catch four dances at the Masonic Temple, 7:30pm, for FREE. You will be supporting the likes of Anne Marie Robson Smock, Josie Patterson Halford, Ashley Anderson, Sam Hanson, Molly Heller, Mike Watkiss, Movement Forum, Efren Corado, Karin Fenn, Nancy Carter, Aniko Safran and loveDANCEmore intern Katherine Adler. At the same time as October Mudson we’ll release Volume 5 of the journal (can you believe it’s been that many?). Submit your “Back To School” themed writing to loveDANCEmore@gmail.com (details on the journal tab above) and pick up a copy for the archived reviews as well. Below Sam wrote about the debut of co.da’s recent performance. I was there too and was interested by (and aligned with) some of the questions he found stemming from the works of the dynamic women involved. My take was influenced greatly by somewhere I was mere moments before the performance, RW’s “Meet the Choreographer” with Ann Carlson. I have found that those particular events are something I really look forward to because seeing RW in an intimate way (the Blackbox, still rehearsing) is stunning. In other circles I dread those events because I often find choreographers discussing their work drift into this weird place of defense or pretension, not because of who they are, but because it’s hard to verbalize this form for a number of reasons, including that we don’t often do it. But Ann really didn’t disappoint. She did not mince words. She was not elusive about the nature of her choreography. She was direct and succinct and looked to the audience for information about what we were seeing. And that information seemed to matter to her in the way she’ll continue to polish and hone the dancing we had watched together. I didn’t really plan on writing about these exchanges for the blog but I figure that it might encourage more audiences to see the work later this year and also, there was one conversation that still has me stirring. There was a gentleman in the audience you took the mic to let Ann know he was “baffled” by the work and “didn’t know what to make of it.” For a piece that uses a dancer-vocalized-score and is historical in a way that’s definitely not Nikolais, this response was totally reasonable. But when he said it my inner monologue thought oh my god how will we get out of this. Surprisingly, in a way that was not colored by passivity, Ann kept talking to this person about what she’d been thinking and whether or not that gave him a point of entry into the process. This question was so essential to what was seen that I started to realize, this person was not baffled by the dance they were baffled by that question, as was I. It wasn’t necessarily that he didn’t know what to make of it but more of an issue that what he made of it didn’t seem valid to him. I went to co.da with that revitalized idea of myself as an audience member. It didn’t make me naive to what I saw but more imaginative and curious on all counts. It also cemented why I write for and created this blog…because the documentation of dance is pretty essential to the way dance continues to be seen over time and that all these dances make impressions on a miniature history of this area and of us. If reality TV wasn’t enough the Tribune is covering Ballet West’s contract renewals, promotions and the design of the enhanced Capitol Theater. I’m not really sure why the lighting on the outside of the building is a big wow factor in a era where sustainability should probably take precedence but it is nice to enhance the training and performances available in the city. Between the weeks of June 4 and June 16 the Modern Dance Department at the University of Utah held their second annual summer intensive which took place at the Marriott Center for Dance on campus. The original concept for the summer workshop was voiced several years ago in faculty meetings with the realization that the space available on campus was not being utilized during the months where school was not in session. The department wished for students to get dance education and experience that not necessarily being represented in Utah. Department Chair and leader of the Salt Dance Fest program Stephen Koester wanted the experience to lead participants into developing their own creative processes. Last year’s program focused on faculty working in collaboration and improvisation. The goal for this year’s program was to focus on international choreographers with a legacy of working with some of the “greats” of contemporary dance. Vicky Cortez from Costa Rica, Marina Mascarell from Spain, and Paul Selwyn Norton from the UK and Australia served as this year’s faculty. Both women led daily technique classes for two separate levels that were offered. All three led creative and repertory classes in the afternoon which gave students the opportunity to both learn and create. During her performing career Vicky Cortez worked as a guest artist with the late Pina Bausch. Bringing in her own choreographic philosophies, Cortez co-created a piece with participants based on a previous work of her own entitled “Next To the Body”. Cortez said that the program provided her with a true “cultural exchange with American dancers…exchange of ideas and creative lines”. Marina Mascarell has been a part of both Cedar Lake Ballet as well as Netherlands Dance Theatre I and II. Mascarell worked alongside students to create a new work as well drawing upon text and theatrics. She was surprised and impressed with the commitment of the students involved in the program and is hoping to take the energy of a large group back to her work overseas. SB Dance opens “Of Meat and Marrow” this weekend but a new dance group is also having a fundraiser on Sunday. co.da is a cooperative group housed at Sugar Space that will produce excerpts of new choreography by it’s members (including Molly Heller, Nancy Carter and more) but it will also showcase some projects from those outside it’s ranks including Ashley Anderson and Shannon Mockli. Come out Sunday the 10th at 7:30 to see new work and help them raise funds for ongoing projects.